Everything in this guide applies to resonant tom and resonant bass drumheads. Snare drums are a different story, so we’ve dedicated a different article focusing on resonant snare heads. We’ve also left out resonant drumheads designed specifically for bass drums, because they’re worthy of a different article too (stay tuned for that!). Ever wondered how resonant drumheads can change your drum sound? Want to know how to tune resonant heads, or how to pair resonant and batter heads to get the best results? We’ve answered all of the above, and we’ve listed every single resonant tom head available from Aquarian, Evans, and Remo (resonant snare heads are covered here). Resonant drumheads are a critical component to your drum sound, yet they’re often overlooked. We’re here to change that! 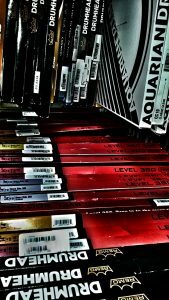 Once you’re done here, you’ll be able to choose the best resonant drumheads for your sound and style, and you’ll know exactly how to get the most out of them. Beyond all of the essential information on resonant heads, you’ll also find plenty of bonus tips and tricks along the way. Importantly, you’ll find all of the resonant head options out there from Aquarian, Evans, and Remo, so you won’t ever need to look anywhere else when deciding. All of these resonant heads can be used on toms, and almost all of them on bass drums too (some aren’t available in a bass drum version). Bookmark this page for the next time you’re changing or tuning your resonant heads, and share it with other drummers who might find it useful! This is a pretty long article (there’s a lot of ground to cover) so grab a drink and get comfortable. One thing worth mentioning: hands-on learning is the secret when it comes to drumhead tuning. If some of this stuff is new to you, then it’s a great idea to sit at your kit and spend some time messing around. Listen for yourself how different resonant head tuning and combinations will change your drum sound. If you’re short on time, bookmark this page so you can come back to it when you need! There’s a lot of info here, so click on a link below to skip to a specific section. Otherwise start scrolling to see everything. What is a resonant drumhead? Why shouldn’t I hit my resonant drumheads? Can I use a batter drumhead as a resonant head? What’s the best resonant drumhead? Clear or coated resonant heads? How often should I change my resonant heads? Do I actually need resonant drumheads? Tip: If there’s anything on this page that you don’t understand, check out the Drum Sound FAQ, where all of the important stuff is explained! The resonant drumhead is the bottom drumhead on each of your drums… It’s the drumhead you don’t hit, and it’s the opposite of the batter head (which is the one you do hit). 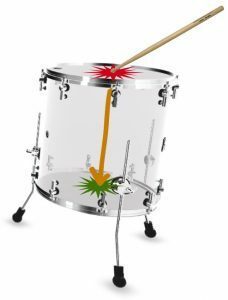 The resonant head resonates when the batter head is hit: It vibrates to give the drum more sustain and tone, and it also helps with volume and projection. Your resonant head has a big influence on your drum’s overall sound, and part of its job is to act like an equalizer for the drum: Different resonant head types and tunings will bring out different frequencies in the overall drum sound. Hit your tom batter head while your hand covers the tom’s resonant head, then try it again without your hand choking the drum. Take off the resonant head and things will sound very different. As you’re putting the resonant head back on, listen to how the sound changes as you tune it from low, to medium, to higher tension. When you do these tests, you should notice how your drum sound big, full, and rings out nicely when the resonant head is free to vibrate properly. Note: Tuning plays an important role here, and we’ve got more information on that later. Freedom to resonate is a very important thing for your resonant drumheads, and it’s critical that they stay in very good condition to be able to do so. The resonant drumhead is the one that you don’t hit… In fact, it’s important not to hit it. Because you’ll affect their ability to resonate properly. Damaging your resonant heads (with stick marks, dents, tape reside, etc.) will make them more difficult to tune, and will alter their sound. You’ll end up with less sustain, tuning issues, and drums that can sound dull and lifeless. Resonant heads need to be in like-new shape to vibrate to their full potential. A light tap while tuning is okay, but never play them like you’d play a batter drumhead. Resonant heads will also naturally wear out over time, even if you don’t hit them. This is because they’re constantly being “hit” by vibrations from the batter head… This slowly affects them, meaning they won’t perform as well as they should. More on this soon! Yes, for toms and bass drums. For snare drums, definitely not (want to know why? see our free guide to resonant snare heads). Since snare drums are a very different story, they won’t be covered in this article. Check the link above for all of the essential information on resonant snare heads. Almost all of the tom and bass resonant drumheads we’ll cover below are also batter heads – in most cases they can be used as either. Generally though, you’ll want to avoid resonant drumheads that are extremely thick and/or extremely dampened. So yes, you can definitely use batter heads on the resonant side, but there’s a limit to how thick or dampened they can be (especially on smaller drums). Further down the page, we’ll cover a lot more on this. In most cases, thin or medium-weight batter heads are the standard resonant head choice. Don’t believe anyone that simply says “this is the best resonant drumhead” without telling you what sound and situation it’s best for. It depends on personal taste, and the sound you want. It’s like asking “what’s the best food” – it all comes down to taste, and you’ll get different answers from everyone you ask. How much sustain (ringing) do you want in your drums? Thin resonant heads won’t ring out as much. The thin material stops vibrating quicker, cutting the sustain. Moderately thick resonant heads are best for a lot of sustain. They’re thick enough to hold a strong sustain, but not so thick that they choke it. Very thick resonant heads are harder to fully activate. Thick material takes a lot more force to get a really strong sustain, and can “choke” itself more easily due to the extra weight. If you’re a hard hitter, thick drumheads can have the potential to produce a big sustain, but you’ll have to hit them like you really mean it. Do you want a bright, warm, or in-between (balanced) drum sound? Thinner resonant drumheads are best for a brighter (higher-pitched) overall sound. Medium-weight resonant heads are a nice middle ground with good balance across all frequencies. Thicker resonant drumheads are best for a warmer (darker) sound. Coated drumheads will also put more focus on warmer tones. In general, the thicker the drumhead, the more emphasis you’ll have on the midrange and lower frequencies. Do you want drums focused on one pitch, or more complex tones? 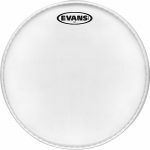 For more focus, choose thicker or coated resonant drumheads, or heads with built-in dampening (like the Evans EC Tom Reso). These reduce overtones, producing a more focused sound. Alternatively, choose thin or clear resonant drumheads without built-in dampening for more complex tones. Tune them right, and theses overtones can sound very musical. Keep in mind that your batter head type and tuning will also contribute a lot to the your drum’s focus. Tip: If you’re just starting out and have no idea which resonant drumheads to buy, go for general-purpose heads that will give you versatility: 10 mil (medium-weight) resonant drumheads with no built-in dampening are a great choice here. They have a balanced sound, they’re usable across almost all styles of music, and they have a fairly strong sustain. Should I Use Clear or Coated Resonant Drumheads? 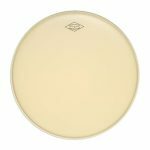 The ‘standard’ resonant tom drumhead is clear, but using a coated drumhead can be a great choice for adding a little more warmth in your sound. On toms, clear is usually the go-to resonant drumhead type, although coated heads can definitely be used as well. With a coated resonant drumhead, you’ll have a slightly warmer tone (i.e. more emphasis on the midrange and lower frequencies). You’ll also have slightly less sustain, since the coating adds a little dampening to the drumhead. There’s a lot of variance for bass drums, although the standard is often a shiny black head with your drum manufacturer’s logo on it. These black drumheads behave like clear heads, since there’s no coating to dampen them. Beyond just clear or coated resonant drumheads, you can also find other more eye-catching designs like the mirror-reflective Remo Starfire, imitation calfskin, or custom-printed drumheads. These heads will usually sound and behave similar to their coated counterparts: Drumheads generally become warmer and more controlled with more “stuff” added to them (e.g. printing, laminate, stickers, coating, etc.). How Often Should I Change My Resonant Drumheads? This one really comes down to the amount of use (and abuse) your drums get. There’s no one-size-fits-all rule for when you should change your resonant heads… Different drummers will keep them for different amounts of time. Personally, I’ll use mine for a relatively long time (a few years), unless I’m playing a lot of shows or constantly changing my resonant head tuning (e.g. for different styles/recordings/etc). The main reason I’ll change my resonant drumheads is if I want a different sound, or if they show signs of damage. Otherwise, there’s no rush to swap them out unless they’ve been on my kit for quite a while (a few years). If I’ve bought a new or used drum kit, I’ll also probably change the resonant heads. Finally, if my drums start sounding a little dead or dull, I’ll change my resonant drumheads (although I’ll check that the problem isn’t with my batter drumheads first). Stock resonant heads (the ones that come with a new drum kit) are usually lower quality than ones you’d buy in a store. This is especially true if you’ve got a cheap or mid-range drum kit. They’ll do the job, but it’s likely you’ll improve your overall drum sound by changing them. Replacing very old resonant heads (5+ years) will make a noticeable difference to your sound, especially if the drums have had heavy use. Resonant drumheads wear out faster for drummers playing a few shows per week (or practicing daily), or for drummers who hit harder. Resonant drumheads will start to sound different if they’re tuned super high for long periods of time. This will be more noticeable if you change them to a lower tuning… they can sound a little lifeless because they’ve stretched under high tension. If your resonant drumheads are damaged, they won’t hold their sustain very well (and they can give you tuning problems). Things like stick marks, tape residue, dents, scratches, etc. will all affect a resonant head’s performance. Long-term extreme environments will affect your resonant heads (and your batter heads, and drums in general!). Avoid constant direct sunlight, storage in extremely hot or cold environments, etc. Today’s drumheads are made to handle a lot of different temperatures, but there’s a limit to the amount of abuse they can take before they stop performing at their peak. So none of the above apply to you? You don’t need to buy a whole new drum kit to make big changes (and improvements) to your drum sound. If you’ve tried different tuning and different batter heads, the next step is to try different resonant heads. Think about how much sustain, brightness, and overtones you want in your sound, and you’ll find the best resonant drumhead for your style. Get yourself a little drum gift, in the form of better drum sound. In the next section we’ve got resonant drumheads for toms fully explained, and most of the heads below are also available as resonant heads for bass drums. Now we’ve covered some important background info, here’s our huge guide with the resonant head choices from Aquarian, Evans, and Remo. All of the options below can be used as resonant tom drumheads, and almost all can be used as resonant bass drumheads (some aren’t available in a bass drum version). 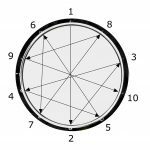 There are also other resonant drumheads designed specifically for bass drums, however we’re going to dedicate another article to explore this in the future. For resonant snare drum heads, you’ll want to check out this page. For the best versatility with your drum sound, it’s most common to use thinner or medium-weight resonant drumheads with no dampening. For smaller toms it’s usually best to avoid very thick resonant drumheads, two-ply resonant heads, or resonant heads with a lot of built-in dampening… These can choke your drum sound. You can get away with using thicker resonant heads on big toms (16″ and larger) depending on the sound you want, and the situation. Bass drums can handle a wider range of resonant drumhead types (including thicker and more dampened options). 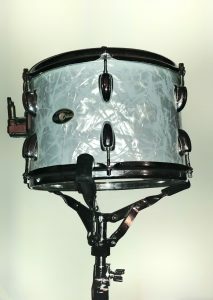 However, like with toms, most people often choose a thinner or medium-weight undampened resonant bass drum head. This is usually what you’ll get on your bass drum if you buy a new drum set. Like with toms, thinner and medium weight resonant drumheads give you the most versatility with your drum sound… Leave them open for a full, ringing sound, or add dampening later to control things. If you like a more focused kick sound, bass drums can handle more dampening. Just don’t go too far… For example, I’d avoid using batter heads like the Evans EMAD or Aquarian Super-Kick as a resonant drumhead – these will be overkill in most situations, especially if you’re using something similar on the batter side. Tip: changing your resonant bass drum head is just one way to change your bass drum sound. What else can you do? Add dampening to your bass drum, change your batter bass drum head, cut a port hole in your bass drum, or (…and this one is often overlooked…) change your bass drum beater. You can also dramatically change the feel of your bass drum by changing your pedal! Okay, let’s get into it… Here’s everything you need to know about the different types of resonant drum heads out there. In general, this list goes from thinner and brighter sounding resonant heads to thicker and warmer sounding heads. At each level, we’ll described exactly how these resonant heads will affect your tom and bass drum sound. You can click on any head’s name to check its price on Amazon. 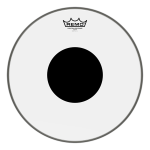 Thinner resonant drumheads are best for a brighter sound, with a shorter sustain. The resonant drumheads below are all single-ply and 6.5 to 7.5mil thick (which is pretty thin). These can be common choices for resonant drumheads, especially for drummers playing quiet or medium-volume music. For resonant drumheads you can put on your entire drum kit, this is as thin as it gets. Note: There are thinner heads available (like the coated Remo Diplomat M5 or Aquarian Concert 5), however these are only available in limited sizes. So how do thin resonant heads sound? The thinner material creates a brighter overall sound, meaning there’s a stronger focus on the higher-pitch frequencies. Thin resonant heads also have less sustain: The thin material won’t hold its sustain as long as thicker resonant heads. The amount of sustain is on the low side of moderate – your drums will sound fairly open, but they definitely won’t ring out forever. Generally, the resonant drumheads in this category are best for softer and medium-volume styles of music. It doesn’t take much force to activate the resonant head, which means your drums will be nice and sensitive for lighter playing. Thin resonant tom and bass drum heads are great for jazz, acoustic rock, or other low and medium-volume situations. That being said though, thinner resonant heads can be used for just about any style of music… It all depends on the sound you’re looking for. Tip: Don’t like it too bright? If you like the idea of a thin resonant drumhead but don’t want your drums to sound too bright, try a coated thin resonant head. The coating takes away some of the brighter edge, rounding out the sound. There’s also slightly less sustain when using coated resonant drumheads, however this is a fairly small difference. 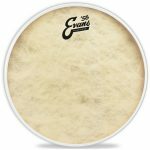 Evans Resonant Glass Tom Reso: This resonant tom drumhead is 6.5mil, making it the thinnest resonant head available – however, it’s only made for toms. The Resonant Glass reacts very quickly even to very light strokes, with a bright sound and a short sustain. If you want the ultimate in responsiveness for super-light playing, this is an excellent choice. Aquarian Hi-Frequency: At 7mil, these are the thinnest resonant drumheads available for both toms and bass drums. The overall tone is very focused on the bright (higher-pitch) frequencies. With these heads, you’ll get a low-moderate sustain, brighter tones, and excellent responsiveness to light touches. Evans Reso 7 Tom Reso: This is a 7mil coated resonant drumhead. It has a shorter sustain compared to many of the other clear heads in this category, and a slightly warmer sound – both of these tonal features are thanks to the coating. Evans Resonant Black Tom Reso: This 7.5mil resonant tom head has a low-moderate sustain and a bright tone. The black finish looks great on drums, and gives a very similar sound to a clear drumhead. Sound-wise, it’s most similar to a clear Remo Diplomat or clear Aquarian Hi-Frequency. Remo Diplomat: Like the Aquarian Hi-Frequency, the Diplomat is available for both toms and bass drums. At 7.5mil, the Diplomat is slightly thicker the High-Frequency, although the difference between these resonant heads is fairly small when it comes to the actual sound. You can expect a very similar bright tone, with a moderate sustain, bright overtones, and very good sensitivity for quiet strokes. Medium-weight resonant heads are best for a well-balanced drum tone with a strong sustain. The drumheads listed below are all 10mil thick, which is considered medium-weight. This thickness is a go-to choice for resonant drumheads because of versatility, good sustain, and a balanced overall sound (not too bright, not too dark). How do medium-weight resonant heads sound? 10mil resonant heads will perform very well in just about any musical situation: They’re great for medium and high volume drumming, and will also be usable at softer volumes. If you’re playing extremely softly, you might benefit from a thinner resonant head to get a really good response and tone at very low volumes. The sound of 10mil resonant heads is quite well balanced… The weight gives extra midrange and low-end tone compared to a thinner drumhead. This means you can expect a fairly even amount of high, medium, and low frequencies in your drum sound. If you want to create a warmer and darker sound, choosing 10mil coated resonant drumheads will get you there. As well as balancing out the sound, the added weight of these heads also allows for more sustain: Your drums will ring out more with a medium-weight resonant head compared to thinner resonant heads. Overall, medium-weight resonant drumheads are a great option if you like nice depth and balance to your drum sound: These resonant heads have a bigger, fuller sound compared to the thin resonant drumheads above, and they’ll perform well in just about any situation. This means that they’re a great general-purpose resonant head choice. 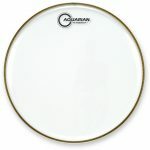 Aquarian Classic Clear: This 10mil drumhead gives a strong sustain and a balanced tone. You can expect a good spread of high, midrange, and lower frequencies. 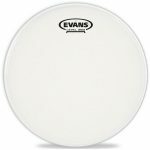 Evans G1: Similar to the Aquarian Classic Clear, this is a 10mil drumhead giving a strong sustain, and a balanced drum tone. Evans Genera Resonant: This 10mil resonant head is similar to the Evans G1, but with a slightly brighter sound due to the different (clearer) single ply. This is useful for better projection, helping your drum sound cut through and stand out. Remo Ambassador: This is a 10mil drumhead with a strong sustain and a balanced drum tone, similar to the Classic Clear or G1. Tip: If you’re unsure which resonant drumheads to buy, any of the above 10mil clear heads are an excellent place to start. They’re the sweet spot between nice sustain, good balanced tone, and versatility. Once you’ve used these resonant heads for a while, you’ll know whether you’d prefer something thinner or thicker. What about non-standard 10mil resonant drumheads? Evans J1 Etched: The sound of this 10mil drumhead is somewhere between clear and coated. The etched surface slightly reduces the brighter frequencies, but not as much as with a coated resonant drumhead. They’re a great choice if you want the coated look, without warming up your sound as much as a coated resonant head would. Evans EC Resonant Tom Reso: The 10mil EC is a resonant head with control rings around the edge of the drumhead. These rings remove some of the higher-pitch frequencies and reduce overtones and sustain. The result is a shorter, lower-pitched drum tone that is more focused on the fundamental note. These resonant tom heads can be great on hard-to-tune drums, to remove clashing overtones. 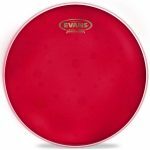 Evans Calftone Tom: The Calftone range features a synthetic material designed to have the look and sound of real calfskin drumheads. The tom version has a 7mil ply with an extra layer laminated on top, making it behave like a medium-weight resonant drumhead. These heads are warmer sounding than most other heads in this category, with a moderate sustain and a great look. Note: the bass drum Calftone version is thicker than the tom version (a 12mil vs. 7mil ply). Remo Ambassador Suede: Similar to the Evans J1 Etched, the Ambassador Suede lies between clear and coated in terms of sound. The suede texture gives a slightly warmer tone compared to a clear Remo Ambassador. The Ambassador White Suede and Black Suede versions also look great – they give a nice visual character to your drum kit when used as resonant heads. 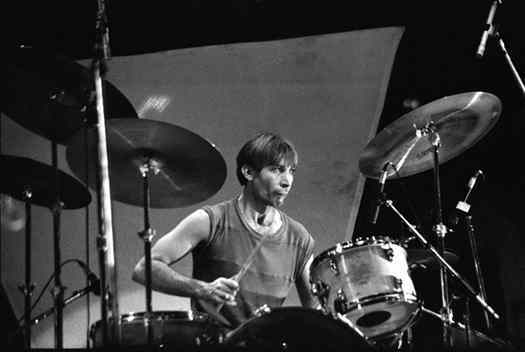 Charlie Watts using the Remo Controlled Sound Black Dot as a resonant drumhead (source). Compared to the Remo Ambassador, the CS Black Dot has a slightly shorter and darker sound, with more focus (less overtones). As resonant heads, they’re good for putting a little more emphasis on the warmer frequencies, for slightly reducing the ringing, and for rounding out your drum sound. While the Remo CS are mainly used as batter heads, they’re a valid choice as resonant heads (for example, Charlie Watts from The Rolling Stones has used them). Remo Diplomat Fiberskyn: These drumheads are a total of 10.5mil thick (made up of a 7.5mil ply, plus a 3mil synthetic fiber laminated top layer). The synthetic fiber is designed to look and sound like calfskin, similar to the Evans Calftone mentioned above. You can expect a strong warm midrange tone when using these heads, with slightly less sustain compared to most other medium-weight resonant heads. Aquarian Classic Clear with Power Dot: These have a very similar sound to the Remo CS Black Dot (above), giving a slightly darker and more focused sound compared to the regular Classic Clear. They’re usually used as batter heads, but they’ll sound great as resonant heads if you’re looking for medium-weight head with a slightly shorter and more controlled sound. 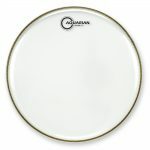 Aquarian Modern Vintage Thin: These are thin 7mil drumheads, but due to the added fiber coating they behave much more like medium-weight resonant drumheads. The Modern Vintage range is similar to the Calftone and Fiberskyn heads above, designed to have the warmer tone that calfskin drumheads offer. As a resonant head, the Modern Vintage Thin is moderately responsive, with a medium-length warm sustain. Thicker resonant drumheads are best for a darker sound and (sometimes) a good sustain… Just beware of going too thick, or you can choke your drum sound. Thicker single-ply resonant drumheads will push your drum sound more towards the warmer side of the spectrum, and they have the potential for a big sustain. The word potential is used when talking about sustain here, as you need to hit your drums harder to create a really strong sustain. The thicker material takes more effort to fully vibrate. Bigger drums are more tolerant of thicker resonant drumheads – they can be very effective on floor toms and bass drums. Use caution when putting thick resonant heads on small drums, because you’ll risk choking them. There are some good thicker resonant drumhead options, but keep in mind that the thicker you go, the less sensitive your drums will be… This means if you play with a lot of light touches and ghost notes, you might not have great stroke definition and tone. If you play harder, then read on for the best resonant drumheads for a long sustain and a warm tone. Tip: Thick resonant drumheads can be handy if you have tuning problems. For example, damaged bearing edges can make drums hard to tune with thinner heads on them. In these cases, try a thicker resonant drumhead (although if the bearing edge is really bad, you might be out of luck…). The heads below are a slight step up from the more standard 10mil, but they’re still in the same ballpark. You can think of these as dipping your toe into the thicker-resonant-head water, without going too extreme. For medium and high-volume drumming, the resonant heads below can be a great choice. Aquarian Modern Vintage Medium: This is a 10mil drumhead with an extra layer on top, making it behave more like a thicker drumhead. The extra later is designed to imitate the sound of calfskin drumheads: the added material and weight dull the higher frequencies. Used as a resonant drumhead, the Modern Vintage Medium has a very warm sound and a moderate sustain when hit harder. Your drum sound will be smoother, since the brighter frequencies are reduced. Evans G12: Evans is currently the only big brand to produce a clear 12mil head for toms. These heads are thicker than the more commonly-used Evans G1, but they’re still a great option for resonant drumheads (especially the clear version) if you hit a little harder. Sound-wise, they’re slightly darker compared to a 10mil resonant head, although they still have a good cutting brighter edge. The G12 can also give a nice big sustain when you lay into them. This head is available coated if you want an even darker sound, with the coating smoothing out the higher frequencies. Clear is a good general-purpose choice for these resonant heads, otherwise try the coated version if you really want to warm up your drum tone. Remo Ambassador X: The 12mil Ambassador X is very similar in sound to a coated Evans G12. There’s a good focus on the warmer tones, and you can get a nice strong sustain with harder hitting. Unlike the Evans G12 (which is only available for toms), the Ambassador X is available for both toms and bass drums. This head is only available coated however, so go with the clear G12 if you’re worried about the Ambassador X’s warmer drum tone getting lost in the mix. Otherwise, these are a great resonant head choice for drummers who hit a little harder. Remo Starfire: These are eye-catching reflective 12mil single-ply drumheads. The Starfire are like having mirrors for drumheads, and they look great as resonant heads (especially under stage lights). They’re more controlled compared to other 12mil drumheads (like the G12 above): The reflective laminated surface will reduce your sustain and overtones, giving a more focused and slightly punchy drum sound. These heads are available in gold and silver versions for both toms and bass drums. Remo Ambassador Fiberskyn: These drumheads are 13mil thick in total (a 10mil ply plus a 3mil top laminated layer). The top layer is a synthetic fiber, designed to look and sound like traditional calfskin heads. Used as a resonant head, the Ambassador Fiberskyn can give a solid warm sustain (especially when hit hard). Compared to most of the other heads above, the sound is darker due to the fiber coating, and these heads are a little less responsive due to their thicker design. Evans G14: As with 12mil clear heads, Evans is the only big brand to produce clear 14mil single-ply heads. Used as a resonant tom drumhead, the G14 gives a long sustain, especially when hitting hard. The clear G14 has a slightly warm tone, with the coated version being even warmer. These heads are not very responsive due to the very thick material, making them unsuitable as resonant heads for light drumming. If you’re a loud and hard-hitting drummer looking for a big, warm, and full drum sound, these resonant heads are worth checking out. Note that for resonant heads, 14mil is very thick: Use these with caution on smaller drums, as you’ll risk choking the drum tone (especially when hitting softly). Okay, we’re getting into much more extreme territory here. Two-ply resonant heads are a risky and much less versatile choice: You’ll limit your drum sound options if you go down this path. For a deep and focused thump, two-ply resonant drumheads on floor toms and bass drums can sound great. Smaller drums can be much less tolerant of two-ply resonant heads, but using them on small drums is not unheard of (especially when tuned higher). Even though it’s not the best idea to buy two-ply resonant heads as a general-purpose option, we’ll cover them below so you can understand when and how you can use them. If you’re not experienced with resonant drumheads, I’d suggest sticking with the one-ply options above… You can easily end up with dead and dull sounding drums using two-ply resonant heads. However, it’s definitely possible to use them effectively, as long as you know their limits: They’re a valid option if you’re looking for a specific sound. 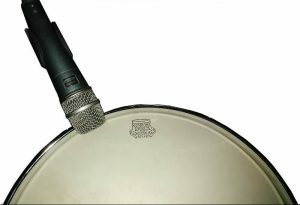 Tip: Two-ply resonant drumheads can be useful to get a more controlled drum sound in the recording studio, or to help with hard-to-tune drums (for example, due to bad bearing edges). When used at a live show, the lack of brightness can mean your drums can get lost in the mix (although this can be overcome by the engineer at the mixing desk). What does a two-ply resonant head sound like? 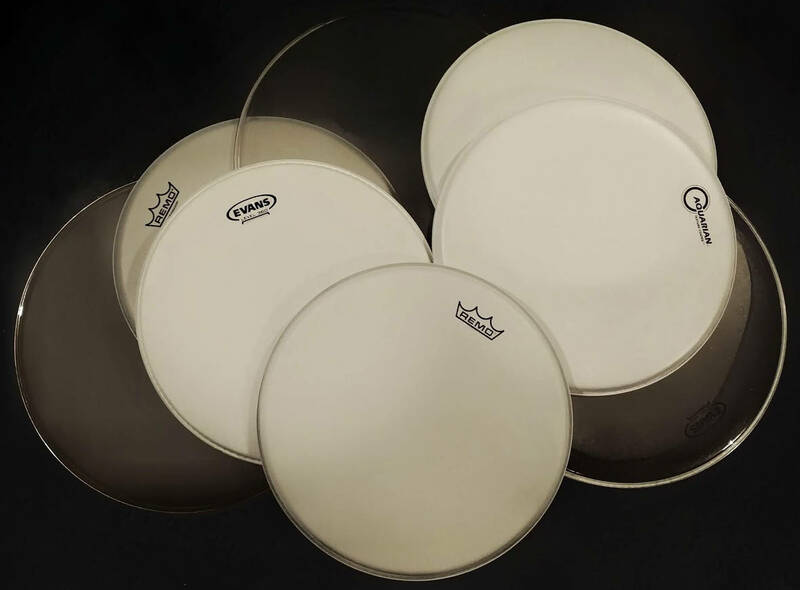 Using two-ply resonant drumheads can help remove overtones, reduce the sustain, and really cut out the brighter frequencies. Your drum sound will be more focused, short, and deep. These heads can be helpful on hard-to-tune drums, since clashing overtones are reduced. Depending on the tuning, you can still get a relatively good sustain using two-ply resonant heads (especially with larger drums). However, the sustain of a two-ply resonant head won’t ever be as strong as with a single-ply head of the same thickness: The two plies are not as free to vibrate, because they’re rubbing against each other (which dampens the sustain). Because of this, there’s a risk of choking your drums. You’ll also need to hit pretty hard to achieve a stronger sustain with these resonant drumheads. Quiet drummers: look elsewhere. You’ll have less responsiveness when using two-ply resonant heads. It takes more force to activate them (compared to a single-ply head of the same thickness), which means quieter strokes won’t be as noticeable. You’ll need to hit your drums harder to get a good tone response (especially when tuned low). If you’re using two-ply resonant drumheads, your drum sound can get a little lost without microphones on your kit (especially when tuned low). The drum sound might not cut through to the audience, even if it sounds okay from behind the kit… This is because a lot of the more noticeable bright tones are reduced. However, this can sometimes depend on your tuning: If you’re using two-ply resonant drumheads, you can tune them a little higher (and use the clear version) to make your drums cut through better. Two-ply resonant drumheads will naturally dampen your drum sound. Adding extra dampening on top of this might push things too far, so use extra dampening very carefully here. For this reason, I’d really recommend avoiding using two-ply heads with built-in dampening as resonant heads (e.g. the Remo Pinstripe, or Evans EC2S)… The added dampening makes it too easy to end up with a lifeless, choked drum sound. Based on the above info, you can see there are quite a few reasons not to use two-ply drumheads as resonant heads. However, it can be worth trying if your specific situation calls for it. On floor toms, for example, you can get some nice results (especially in the recording studio). If your resonant-side bearing edges are in bad shape, a two-ply resonant head can also make your drum easier to tune. Aquarian Super 2: As far as two-ply drumheads go, the Aquarian Super 2 are some of the thinnest out there: they’re 12mil thick. These are a good choice if you’re thinking about using two-ply resonant heads, since they won’t choke your drums as much as the other options below. Compared to most single-ply resonant heads, the Super 2 are a little warmer and more focused, although the clear version still retains some brightness to help your drums stand out. You can expect less overtones and a slightly shorter sustain (although the sustain will still be noticeable, especially when hitting harder). The Super 2 aren’t very responsive as resonant drumheads, so avoid them if you’re playing quieter styles of music. To keep some brightness in your drum sound, get the Clear Aquarian Super 2. Otherwise, try the coated Super 2 for a warmer tone with slightly less sustain. There are also versions of the Super 2 with control dots and control rings, although these really aren’t recommended as resonant drumheads since they’ll usually choke the sound too much. 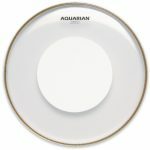 Aquarian Response 2: These are similar to the Super 2 above, but they push things into more extreme territory… They’re a thicker drumhead (14mil vs. 12mil). The added thickness makes them less responsive, and slightly warmer sounding. You can still achieve a good sustain on larger drums, but you’ll need to hit hard to get there. Evans G2: These heads are very similar to the Response 2 above. 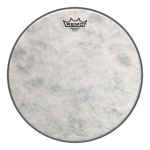 A 14mil two-ply drumhead, these are an extremely thick resonant head choice with low responsiveness, a warm sound, and a big sustain when hit hard. Remo Emperor: This is Remo’s version of the 14mil two-ply drumhead, and it performs very similarly to the G2 and Response 2 heads above. This is a very thick resonant drumhead option, with a warm sound, low responsiveness, and the potential for a big sustain when hit hard. Note: There are a lot of other 14mil (and thicker) two-ply drumheads out there with built-in dampening. These won’t be covered, since they’re really not recommended as resonant drumheads due to their very controlled sound. Feel free to experiment though! There are two key areas to cover when it comes to tuning resonant heads. First up, you need to know the basics of tuning them – get this right, and you’re well on your way to a great drum sound. Beyond just good tuning though, you also need to think about how your resonant head tuning relates to your batter head tuning and the drum itself. The batter and resonant heads work together, along with the drum, to produce your overall sound… Because of this, it makes sense to understand how they interact with one another. First we’ll look at the basics of tuning resonant drumheads, then we’ll cover the relationship between resonant and batter head tuning. How Do I Tune Resonant Drumheads? Start with your resonant head finger-tight at each lug. Doing this at the beginning ensures you’re starting each lug at the same tension. Always tune in a star pattern, moving to the lug furthest away from the one you’ve just tuned. Tune each lug 1/8 or 1/4 turn with a drum key. After each lug, tune the opposite lug next (or the one furthest away from the lug you’ve just tuned). You’ll tune in a star pattern rather than in a circle around the drum, to help spread the tension evenly around the drumhead. Always turn the drum key the same amount for each lug. Once you’ve done a full pass of all lugs, tap/hit the drumhead’s center to check the tone and repeat until you’re close to your desired pitch. If you use a drumstick, don’t hit the resonant drumhead too hard – remember to keep it in like-new condition so it can resonate properly. Tip: It’s helpful to also hit the batter head during this step, to hear how your resonant tuning affects the drum’s overall sound. When you’re close to your desired sound, check each lug is tuned to the same pitch: Tap the drumhead near each lug (about an inch from the edge), and adjust if needed. If some lugs have a different pitch, you’ll get clashing overtones that can make your drums sound strange… Make some small tuning adjustments at each lug until the tone is the same, right across the drumhead. Turn the drum over and hit the batter head, to check the drum’s final sound. Tip: When you’re matching the pitch of the resonant-side lugs, choke the batter head so it doesn’t interfere with what you’re hearing. Rest the drum upside-down on your drum throne or on carpet: You’ll hear the resonant head’s pitch much more clearly without the batter head vibrating. The most important thing with drum tuning is to make sure the drumhead is the same tension all the way around. If the drumhead is tighter in one area, it will likely sound strange. Tip: For more information on drum tuning, take a look at the drum tuning basics and drum tuning tips. What Pitch Should I Tune My Resonant Drumhead To? A drum’s size and shape will dictate its tuning range: each drum has a sweet-spot range where it performs best. This one’s fairly straightforward. In general: the larger the drum, the lower the pitch. You can hit the side of the drum shell with a stick to hear its exact pitch, and this can be a quick trick to find the sweet spot of a drum. Tuning the drumheads to this pitch will generally give you a big, full sound. 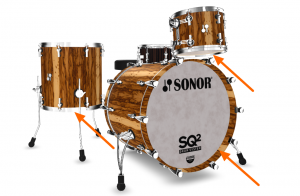 Tip: Each drum behaves differently due to its size, thickness, hardware, and wood type. The key here is to experiment with different tuning, to see what sounds best on your kit. There’s no one-size-fits-all rule here. This is an important relationship to understand. When you’re hitting your batter head, it’s activating the resonant head. The batter and resonant heads work together to produce the overall drum sound. Here’s what you need to know to get a great sound from the interaction of these two drumheads. Note: There’s no best choice here – it all comes down to the sound you want for a specific drumming situation. This gives the most sustain, because the batter and resonant head will feed off each other when hit. Like sympathetic snare buzz, two drumheads tuned to the same pitch will cause each other to vibrate more as they ring out. If you really want to maximize this effect, use the exact same drumhead on the batter and resonant side. In this situation, the two heads will vibrate in the exact same way to prolong the drum’s sustain. Conversely, a big variation in resonant and batter head thickness will have the opposite effect, since the thicker head will always naturally have a lower pitch. Depending on exactly how much sustain you want, you can use the above knowledge to choose the perfect head combination to customize your drum sound. This will make your toms bend in pitch as it rings out. With the resonant head tuned higher than the batter head, you can have less sustain (although this will change depending on how extreme the tuning difference is). Tuning the resonant head higher than the batter head will usually give you a more lively drum sound, with good projection. This is useful if you need your drum tone to cut through and be more noticeable. One important thing to mention here – the exact interval between the batter and resonant head can really change your sustain and sound (see the video below for more on this). Finally, if you like your batter head tuned low, then tuning your resonant head higher is a good option to keep some projection in your sound. This will cause your toms to bend in pitch as they ring out, although often not as much as tuning option 2 above. Tuning the resonant head lower than the batter head can give you a good, deep sustain (as long as the tuning difference between the heads isn’t huge). 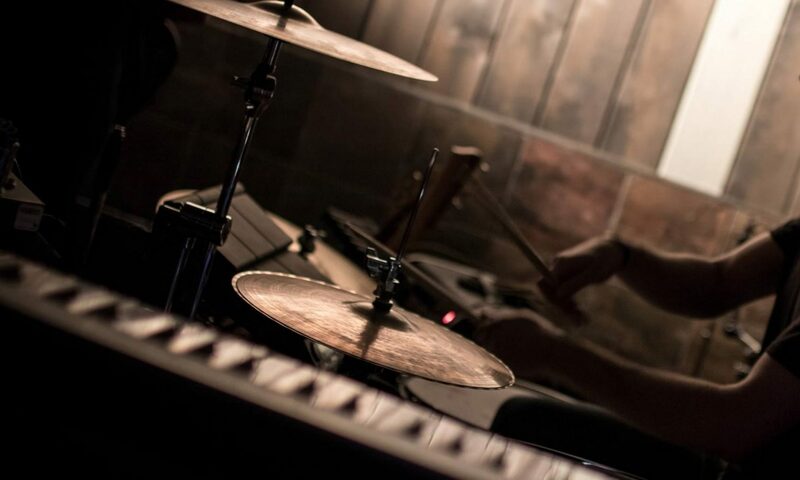 With this tuning style, your drums will usually sound mellower and smoother. This is handy if you need a more subtle drum sound (for quiet acoustic shows), or a very deep tone (using microphones). With this tuning style, you can tune your batter head higher for better stick rebound, while still getting a lower overall drum pitch due to the low resonant head. Like with tuning option 2 above, the exact interval between the batter and resonant head will affect your sustain and sound (see the video below for more on this). Want more information on resonant and batter head tuning interactions? For more great info on drum tuning, check out Kenny Sharrett’s YouTube channel. Spend an afternoon tuning your kit all different ways. Start from scratch (completely loose lugs) each time. You’ll learn to tune… Drum tuning (like drumming) is a skill that takes practice. You’ll see what your drums can do… Each drum kit has its own range and sweet spot where it sounds the best. Take some time to find yours, and you can really improve your overall sound. Every kit is different. A lot of people get stuck when trying to figure out which resonant head to use with a particular batter head. However, it’s not super complicated… Your overall drum sound is a combination of the batter and resonant head’s individual sound. If you’re using a bright sounding batter head with a bright sounding resonant head, your overall drum sound will be quite bright. If you switch the resonant head to a warmer sounding one, your sound will become warmer. The same straightforward rules apply for sustain, overtones, and other drum sound variables. Should my resonant head be thicker, thinner, or the same as my batter head? You’ll generally want your resonant drumhead to be thinner or the same thickness as the batter head in just about every situation. Because it’s easier for a thicker material to make a thinner material vibrate. Remember that when you hit the batter head, it causes the resonant head to vibrate. This makes the resonant head produce the tone as the drum rings out, which is the main job of the resonant drumhead. If the resonant head is thicker, it won’t activate to its full potential when the thinner batter head is hit. If the resonant head is thinner than the batter head, it’s easier to activate it. A thicker batter head will create stronger vibrations than the resonant head, and if there’s a thinner resonant head below it, this thinner head can easily react to those vibrations. You’ll be able to get the full sound potential out of your resonant head with this setup. If the resonant head is the same thickness as the batter head, you’ll also get a very good response from the resonant head. Since the two drumheads are the same, they’ll vibrate together the same way when the drum is hit. This will produce a big, full sound. Just beware of using really thick or two-ply resonant drumheads if you’re going down this path… There’s a limit here. When the resonant head is thicker than the batter head, the batter head produces weaker vibrations compared to what the resonant head is capable of producing. In this case, you’ll need to hit much harder to get a good tone from the resonant head, which usually doesn’t make sense. There might be situations where this setup can work, but as a general rule it’s best avoided… You’ll get thinner and weaker sounding drums, because the thin batter head struggles to fully activate the thicker resonant head. Want to find the best batter drumheads to match your resonant heads? Use our free Drumhead Selector to filter through a huge range of drumheads: You can search by thickness, which means you’ll quickly find the best batter and resonant drumhead combination for your kit. Do I Need Resonant Drumheads On My Drum Kit? The short answer: Yes. Usually. If you’ve read this far, you’ll know that resonant drumheads contribute a lot to your drum sound. However, some drummers choose to play without them, which isn’t wrong – if you do this, just make sure you’re doing it for the right reasons. What if I remove my resonant drumheads? Removing the resonant heads will have a huge effect on your overall sound. Concert toms: No resonant heads! Plenty of drummers have played with no resonant heads on their kit (especially in the 1970s, when this was a popular thing). Before you remove your resonant drumheads though, make sure you understand how it affects your drum sound. 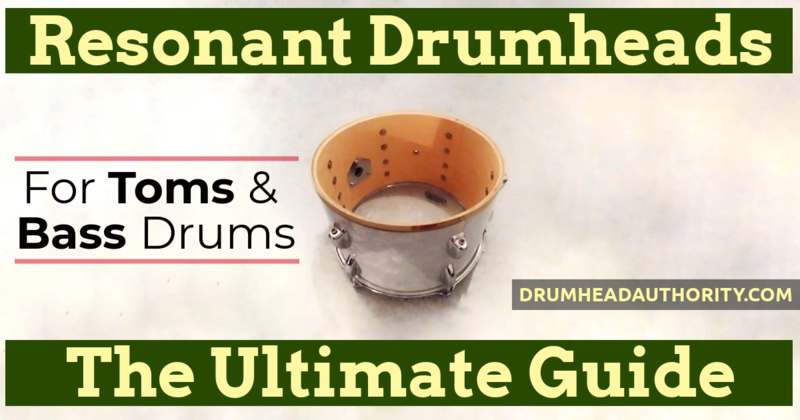 Tip: For other ways to get a very similar drum sound without needing to remove your resonant heads, check out our huge drum dampening guide. One risk when playing without resonant drumheads is that it may sound fine from behind the kit, but from the audience’s perspective your drums can really lack depth and projection. When you’re sitting at your drum kit, the batter heads are more-or-less facing towards you… This means you hear the maximum amount of sustain coming from them. From the audience’s perspective though, the resonant drumheads give the depth, sustain, and overall “boom” to the sound. Tip: Ask someone else to play your drums while you walk around the room – you’ll quickly hear how the overall sound changes. Since your sound changes depending on the listener’s location, it will also change depending on whether you have microphones on your kit or not. Microphones on your batter heads will pick up more sustain, and you therefore might get a nice sound without resonant heads. At live shows for example, it’s not uncommon for the sound engineer to add reverb to toms to create a big sustain, even though the drums aren’t actually producing this themselves. The situation changes again if you’re using overheads and room mics though… Often the big boomy tom and bass drum sound comes from the overheads (rather than the batter head mics). Check you’re not missing this sound if you’re recording without resonant heads. The best advice here is use your ears, and think about what the listener will hear. There’s another important problem when playing without resonant drumheads: you risk damaging your bearing edges. Damage these and you’ll have a very hard time tuning your drums when you put the the resonant heads back on. Without the drumhead and hoop, your bearing edges are left naked and exposed. So what can you do? Get some old drumheads and cut a huge hole in each of them, leaving just 1-2 inches around the outside of the head. Install these as your resonant drumheads to keep your bearing edges in top shape. You’ll have the no-resonant-head sound, and your bearing edges will be fully protected. What’s your favourite drumhead combination? Have you found something unexpected that works really well? 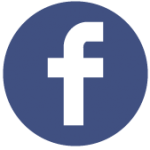 Share it with us via Facebook! If you want to learn more about resonant drumheads, check out our resonant snare heads article. In the future, we’ll also have an article dedicated to resonant bass drum heads. For more free drumming resources, check out our other articles, or use the web’s most advanced drumhead search engine to find the best drumhead for your style.